Left-bank Ukraine (Ukrainian: Лівобережна Україна, translit. Livoberezhna Ukrayina; Russian: Левобережная Украина, translit. Levoberezhnaya Ukraina; Polish: Lewobrzeżna Ukraina) is a historic name of the part of Ukraine on the left (East) bank of the Dnieper River, comprising the modern-day oblasts of Chernihiv, Poltava and Sumy as well as the eastern parts of Kiev and Cherkasy. The term appeared in 1663 with the election of Ivan Bryukhovetsky as the hetman of Ukraine in opposition to Pavlo Teteria. Bryukhovetsky was the first known "left-bank Ukraine" hetman over the area that was under the Russian influence. Until the mid-17th century the area belonged to the Polish-Lithuanian Commonwealth, and since the Treaty of Pereyaslav of 1654, besides of its southern part (part of Taurida), it fell under Russian control, later reaffirmed in the Treaty of Andrusovo (1667) and the Eternal Peace Treaty (1686) between the Polish-Lithuanian Commonwealth and Tsardom of Russia. 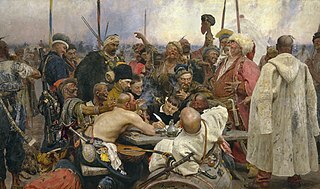 Under the Russian rule, the left-bank Ukraine initially enjoyed a degree of autonomy within the Tsardom (from 1721, Imperial Russia) as the Cossack Hetmanate, which was slowly withdrawn throughout the eighteenth century when the Zaporizhian Sich was destroyed. This article about a location in Ukraine is a stub. You can help Wikipedia by expanding it. The Zaporozhian Cossacks, Zaporozhian Cossack Army, Zaporozhian Host or simply Zaporozhians were Cossacks who lived beyond the rapids of the Dnieper River, the land also known under the historical term Wild Fields in today's Central Ukraine. Today much of its territory is flooded by the waters of Kakhovka Reservoir. The Truce of Andrusovo established a thirteen-and-a-half year truce, signed in 1667 between Tsardom of Russia and the Polish–Lithuanian Commonwealth, which had fought the Russo-Polish War since 1654 over the territories of modern-day Ukraine and Belarus. A Treaty of Perpetual Peace between the Tsardom of Russia and the Polish-Lithuanian Commonwealth was signed on 6 May 1686 in Moscow by Polish-Lithuanian Commonwealth envoys: voivod of Poznań Krzysztof Grzymułtowski and chancellor (kanclerz) of Lithuania Marcjan Ogiński and Russian knyaz Vasily Vasilyevich Golitsyn These parties were moved to cooperate after a major geopolitical intervention in Ukraine on the part of the Ottoman Empire. Right-bank Ukraine is a historical and territorial name for a part of modern Ukraine on the right (west) bank of the Dnieper River, corresponding to the modern-day oblasts of Vinnytsia, Zhytomyr, Kirovohrad, as well as the western parts of Kiev and Cherkasy. It was separated from the left bank during The Ruin. The Zaporozhian Sich was a semi-autonomous polity and proto-state of Cossacks in the 16th to 18th centuries, centred in the region around today's Kakhovka Reservoir and spanning the lower Dnieper river in Ukraine. In different periods the area came under the sovereignty of the Polish-Lithuanian Commonwealth, the Ottoman Empire, the Tsardom of Russia, and the Russian Empire. Zaporizhia is a historical region in central Ukraine below the Dnieper River rapids - hence the name, literally "(territory) beyond the rapids". Ivan Samoylovych was the Hetman of Left-bank Ukraine from 1672 to 1687. His term in office was marked by further incorporation of the Cossack Hetmanate into the Tsardom of Russia and by attempts to win the Right-bank Ukraine from Poland-Lithuania. The Nalyvaiko Uprising was a failed Cossack rebellion against the Polish-Lithuanian Commonwealth. Headed by Severyn Nalyvaiko, it lasted from 1594 to 1596. The second in a series of failed Cossack uprisings, the conflict was ultimately won by the Crown of Poland, but two years of warfare and scorched-earth tactics employed by both sides left much of right-bank Ukraine in ruins. The Russo-Polish War of 1654–1667, also called the Thirteen Years' War, First Northern War, War for Ukraine or Russian Deluge, was a major conflict between the Tsardom of Russia and the Polish–Lithuanian Commonwealth. Between 1655 and 1660, the Swedish invasion was also fought in the Polish-Lithuanian Commonwealth and so the period became known in Poland as "The Deluge" or Swedish Deluge. Because of this, it is sometimes referred as Russo–Swedish Deluge. Polish-Cossack-Tatar War was the war between the Polish-Lithuanian Commonwealth and the Ottoman Empire over Ukraine. It was one of the aftermaths of the Russo-Polish War (1654–67) and a prelude to the Polish–Ottoman War (1672–76). The Battle of Podhajce was fought in the town of Podhajce in the Polish-Lithuanian Commonwealth, and the area surrounding it as part of the Polish-Tartar War and the Great Turkish War. The army of the Polish-Lithuanian Commonwealth under John III Sobieski, totaling around 9,000 men defeated Tatar and Cossack forces under Petro Doroshenko and Adil Giray, which totaled around 35,000 men.